The closest thing we have to time travel is our memories. 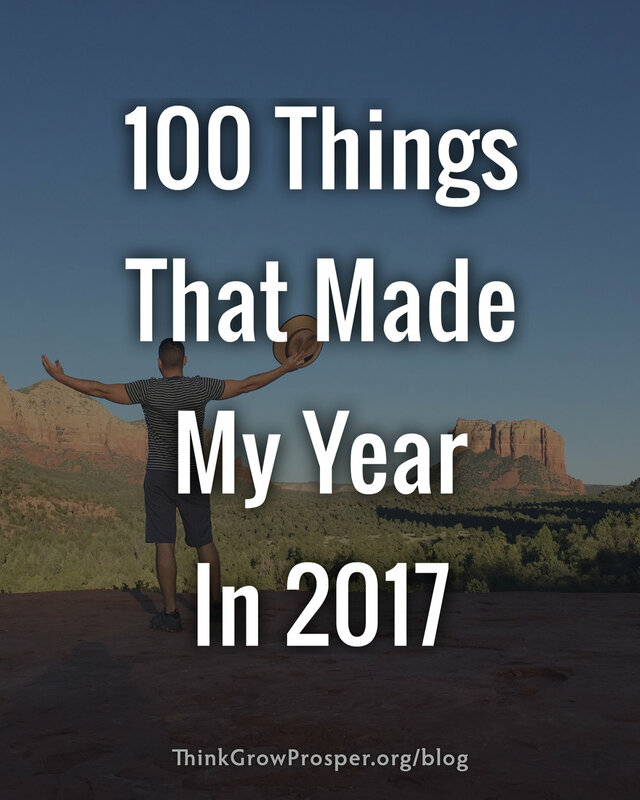 I wrote this list to relive some of the memories that brought me joy or impacted me in a positive way this past year. I also wrote this list to document things I tend to forget. For example, I sometimes inadvertently drop certain habits that serve me well. Or, when I'm having a bad day, I have a tendency to forget recent events or experiences that once made me happy. This list will serve as a reminder for both. Finally, I wrote this list to share more of my life with you. Personal development is much more than life advice or pithy wisdom. It’s about applying those concepts within the context of your life. Sometimes it’s just helpful to know there's someone out there you can relate to. I was inspired to write this after reading Steal Like An Artist author Austin Kleon's blog post of the same name. (Side note: Austin's other book Show Your Work is on my list of books to help you think, grow, and prosper in 2018). Being a tourist in my own city. Driving slowly through historic neighborhoods. Going to museums I’ve passed often but never visited. Mural hunting. Getting to know myself better through Myers-Briggs typing and other personality frameworks. Appreciating and embracing my unique personality tendencies. Salted caramel lattes from my favorite local restaurant/cafe, Five Points Market. Turning off email notifications on my phone. Not answering every email I get. Using the 1 Second Everyday app to document my entire year in micro video clips. Taking Marie Forleo's B-School and fine-tuning the business vision for ThinkGrowProsper. Changing how I read books. Giving myself the freedom to not finish a book if I lose interest. Starting in the middle. Skipping around to parts that speak to me. Learning more about anxiety. Listening to a podcast where former news anchor Dan Harris talks about his on-air panic attack and retroactively realizing that I’ve had a similar experience. This book stand that conveniently lets me read while I eat. Also great for checking source material while I write. TSA Pre-check. (Totally worth it. Would recommend if you fly more than a few times per year). Reading more fiction books like The Hitchhikers Guide to the Galaxy and The Celestine Prophecy. Finally getting a new laptop to replace the one I’ve had for 10 years. Learning more about physics and string theory. Reading The Elegant Universe by Brian Greene and watching the 2003 Nova special on YouTube. Designing, selling, and shipping out the first ever ThinkGrowProsper quote prints. Creating and launching my first course. Learning how to do muscle-ups. Riding bicycles in San Francisco with Vanessa. Having extremely sore legs the next day. Taking engagement photos in Sedona with our amazing wedding photographers and now friends, Kristen Curette and Daemaine Hines. Speaking at the American Marketing Association about content creation, influencer marketing, and Instagram strategy. Being featured in K-Swiss’ Generation K campaign and sharing my entrepreneurial journey. Taking my parents to see the live action version of my favorite childhood Disney movie, Beauty and the Beast. Working on my book. Doing exhaustive research for my book. Torturing myself trying to write the end-all-be-all personal development book. Eventually realizing I need to chill out and keep it simple. Realizing I need to write the book I want to read, not the book I think other people want me to write. Watching The Good Place on Netflix and relating to Chidi so hard. Sharing the video of me proposing to Vanessa on Instagram. Getting better about sticking to a daily routine. Getting sun on my skin first thing in the morning. Taking cold showers in the morning to wake up my nervous system. Experimenting more with brain-supporting herbs and supplements like bacopa and mucuna. Starting my day with 15-20 minutes of movement to get my blood pumping. Eating protein within an hour of waking up to help stabilize my blood sugar for the whole day. Using Drake to teach personal development principles. Sipping on homemade cacao drinks while I write. Afternoon desert walks with Vanessa. Making Vanessa a super coffee every morning. Friday brunch dates (aka "work meetings") with Vanessa at Five Points. Touring beautiful wineries in Napa Valley. Doing crossfit for a few months. Quitting crossfit. Incorporating elements from crossfit into my daily workout routine. Randomly deciding to participate in a 5K obstacle course race with Vanessa. Being featured in Daniel DiPiazza's book on entrepreneurship, Rich20Something. Sharing more of my day-to-day life with 3 million people on Instagram via Stories. Doing more personal posts. Consuming more audio. Especially audiobooks and lectures from Audible. Taking mind-expanding courses like Big History and Redefining Reality. Listening to thought-provoking podcasts like The Tim Ferriss Show, The Joe Rogan Experience, and Waking Up With Sam Harris. Spending the majority of my "entertainment budget" on books. Learning how to think better. Learning how to learn better. Impromptu trips to Sedona with Vanessa. Hiking in the gorgeous Sedona red rocks. Cliff jumping. Watching (and making a big deal about) the solar eclipse. Listening to relaxing background mood music while I work. Receiving surprise advance copies of books and gifts in the mail from authors I admire. Creating and working out to motivating gym playlists. Road tripping through Texas with Vanessa and listening to life-affirming country music from the 90’s and 2000’s. Going to the Alamo Drafthouse in Austin for the first time and watching the Big Sick. Making my own Chaga mushroom extract. Nerding out about herbalism. Documenting my thoughts daily using the memo and voice note apps in my phone. Watching Cosmos with Neil deGrasse Tyson on Netflix. Being in awe of the utter vastness of the universe. Becoming an uncle to my beautiful niece! Watching my little brother become a dad. Watching my parents become grandparents. Getting only slightly jealous that they love their granddaughter more than me. Sipping prickly pear-based drinks to survive the scorching Arizona summer heat. Getting rewarded later with the epic monsoons. Filming the new and improved version of the Mindset Shifts Masterclass. Visiting Nashville for the first time. Stumbling on the most delicious paleo donuts at Five Daughters Bakery in Nashville. Eating the most delicious sorbets at Jeni's in Nashville. Visiting Washington D.C. and its impressive monuments for the first time. Rummaging through antique bookstores in Washington, D.C. Visiting the Smithsonian Museum of Natural History (especially the Human Origins exhibit) in D.C. Going through my old notebooks from 10 years ago and seeing how far I've come. Getting married to the love of my life and having the most beautiful wedding ever! DIYing my own Tin Man costume and making my entire family dress up like Wizard of Oz characters for Halloween. Playing “Yellow Brick Road” every time we answered the door for trick-or-treaters. Spending more time with my super smart eight-year old nephew. Observing him and learning how to enjoy every moment and ask more questions. Snuggling up with Vanessa on our couch at the end of the day and watching an episode (or four) of our favorite shows: Game of Thrones. New Girl. Modern Family. Fresh Off the Boat. Scandal. Rick and Morty. Re-watching nostalgic TV shows. Boy Meets World. Home Improvement. Friends. Gilmore Girls. Making a sweet potato pie every week in November. Eating foods that make me feel amazing more often. Sweet potatoes. Oatmeal. Coconut. Turkey. Eggs. Mangos. Walnuts. Hemp Seeds. Not eating foods that don't agree with me. Going through all our beautiful wedding photos and sharing them with friends and family. Going crazy with Christmas decorations. Officially naming our house “Reindeer Crossing” for the holidays. Hosting our first annual "Christmas Bonanza Extravaganza” at our house. (Attendees included our nine immediate family members). Roasting chestnuts over an open fire with an old-fashioned roaster. Popping popcorn over an open fire. Watching a spectacular meteor shower with Vanessa. Expanding my tool set. Buying more hand tools and being handier around the house. Nesting and getting ready for fatherhood. Building my own bookcase from scratch. (I deconstructed our old wooden coffee table then used the reclaimed wood for the shelves). Learning how to (almost) solve a Rubix cube. Using GPS less and using my brain more. Doing more hands-on stuff in the real world and being on my phone less. (Finally) getting a new mattress. Realizing it’s totally worth it because we spend a third of our lives sleeping. Reading this article and remembering how precious time is. Compiling this list of books to answer the one question I am most frequently asked. What's one thing that made your year? Leave me a comment below and let me know! Ruben Chavez is a lifestyle philosopher, influencer, and personal development educator. His passion for personal development inspired the creation of his Instagram account, ThinkGrowProsper, which has amassed over 3 million followers. Along with his blog, these platforms are his way of inspiring and connecting with thoughtful, creative, and ambitious people just like you.